What next for the African Standby Force? The readiness of the African Union’s (AU’s) African Standby Force (ASF) was put to the test during a major field exercise over three weeks in October and November. Troops marched into mock battle to take back territory seized by rebels in the fictional state of Carana, set up for Operation Amani Africa II at the SA National Defence Force’s combat training centre in the Northern Cape. Amani Africa II achieved its training objectives and demonstrated the rapid deployment capability of the ASF, which is now considered to be effective on several levels. The AU has been developing the ASF since May 2004. Amani Africa II featured more than 6 000 military, police and civilian participants from Africa’s five economic blocs. It aimed to ensure an African force that is disciplined and effective, with political and diplomatic support, coordinated leadership and reliable logistics. The ASF is a vital part of the AU’s ambition to ‘silence the guns’ by 2020, with African solutions to African problems. Significant strides have been made since the first Amani exercise. 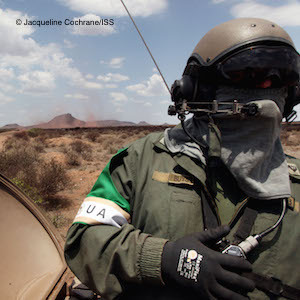 Amani Africa II saw a general improvement in ASF units’ tactical and operational performance, and better cooperation between police, civilians and the military. The ASF has also gained a lot of operational experience. There has been a significant rise in standards, knowledge and confidence, and Africa now has a rich pool of talent to draw on for ASF missions. The ASF will be able to intervene in war crimes, genocide or crimes against humanity if an AU member asks for help, or if the AU considers a situation to be serious enough. The ambition is for the ASF to stop conflict, restore peace, prevent crises from escalating and conduct peacekeeping missions. It will also be considered for humanitarian missions. An important success factor will be the ASF’s rapid deployment capability, with as many as 12 500 trained and equipped military, police and civilian personnel ready for action, anywhere in Africa, within 14 days of a crisis being identified and a commitment made to act on it. This should be followed by a force of up to 5 000 personnel within 90 days, capable of self-sustainment for 30 days. But there is much more to it than boots on the ground. What’s equally important is a complex chain of command, control and communication with strategic, operational and tactical responsibilities. Importantly, the ASF is not just military. They call it multi-dimensional, which means police and civilians are a critical part of the five ASF brigades. Leijenaar also noted a weakness in the functioning of the strategic HQ in Addis Ababa. Modelling and then rehearsing an aggressive intervention against a real enemy takes a lot of planning. Mistakes are best made in practice. In a real fight there is no margin for error. The AU put years of planning into Amani Africa II and the simulated African Mission in Carana, with success measured on diplomatic, political and military fronts. Deployment of the ASF must start with African leaders considering a crisis and committing to action. Foreign partners must be consulted, including the United Nations (UN) Security Council, with its global responsibility for keeping the peace. A clear mission needs to be agreed on, and plans rapidly put in place to get the troops and police into position. The logistics of war and peace are complicated. For every fighting soldier or operational police officer, as many as six people are needed to pay close attention to vehicles, food and fuel and to weapons, ammunition and field hospitals. This gear must be stored, then reliably moved and assembled under challenging conditions. The Cameroonian city of Douala has been selected to host ASF logistics. The ASF is a force built from the military, police and governments of many nations. Contributors to Amani Africa II field exercise were the Democratic Republic of the Congo, Lesotho, Malawi, Mozambique, Namibia, South Africa, Swaziland, Zambia and Zimbabwe. Also involved are Algeria, Burundi, Egypt, Ethiopia, Gambia, Ghana, Kenya, Nigeria, Rwanda and Uganda. The ultimate power and responsibility rest, however, at AU headquarters in Addis Ababa, the strategic HQ where military planners monitor the mission and report to their political masters. Among the ASF’s challenges is also how to transport and support its force and their equipment. For the Amani Africa II field exercise, Angola used its giant Russian Ilyushin aircraft to deliver armoured vehicles and airlift troops from Uganda and Rwanda. Algeria brought troops from Niger, and the soldiers of the Economic Community of West African States were flown in by Nigeria. Amani Africa II also tested the integration of forces with different weapons and training; how fast the force can act; whether troops and officers can follow AU procedures and whether commands are translated effectively by police and soldiers of many nations and many languages. What makes it easier is that 35 African countries already apply North Atlantic Treaty Organization standards, and training is being made consistent across the continent. Preparing for battle in the interest of peace requires sound planning, political commitment and a clearly defined mission. The ASF team proved itself at Lohatlha. South African President Jacob Zuma described it as a historic turning point in Africa’s collective quest for peace and security, demonstrating the positive relationships between African military, police and civilians and collaboration between their home countries. Now Africa’s peace force must be ready for a real challenge – against an as yet unidentified enemy, in a place unknown and at a time not of the AU’s choosing. That will be the true test of the ASF and its potential to preserve, build and keep the peace.